A monosodium salt of thyroxine,regulates important biological functions,including metabolism,nervous system, and cardiovascular system. Important for proper growth and development in children,including a critical role for normal brain development in infants and toddlers. Widely prescribed medicine for the treatment of simple goiter and hypothyroidism. An interventional therapy in patients with nodular thyroid disease or thyroid cancer to suppress thyroid-stimulating hormone (TSH) secretion. Treatment of choice for the suppression of pituitary TSH production in case of non toxic multinodular goiter and various forms of thyroid neoplasia. Taken at bedtime significantly improves thyroid hormone level. Treats euthyroid goiters including thyroid nodules,sub acute or chronic lymphocytic thyroiditis,multinodular goiter. 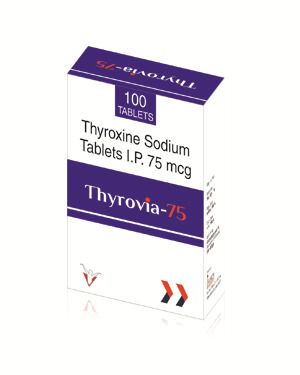 Provides efficacy for thyroid cancer patients who have undergone thyroidectomy, and as an adjunct to surgery and radioiodine therapy.